Pedagogy of team-based interdisciplinary doctoral education – Zion Klos, Ph.D. Example of a “shield-shaped” interdisciplinary thinker who has both interdisciplinary breath and disciplinary depth within multiple fields. We present a framework for a theoretically-based curriculum designed specifically to educate doctoral students headed for careers involving interdisciplinary, team-based research. This framework combines an external component—a synthesis of pedagogical examples and theoretical perspectives drawn from the literature—and an internal component—an analysis of the educational successes and frustrations experienced by the six interdisciplinary, Ph.D. student teams participating in the Social-Ecological Resilience in Changing Landscapes IGERT project at the University of Idaho. We propose to highlight our pedagogical model for training interdisciplinary, team-based scientists and argue for its value as a general curricular model for this type of interdisciplinary education. Referred to as the ‘Idaho Model’ by personnel in the National Science Foundation’s Integrative Graduate Education and Research Traineeship (IGERT) program, this team-based model involves the following elements: (1) identification of a single research question that combines the disciplines of team members, (2) collaborative research that yields disciplinary dissertations on aspects of this research question, and (3) co-authorship of an integrative chapter that is included in each of the dissertations. 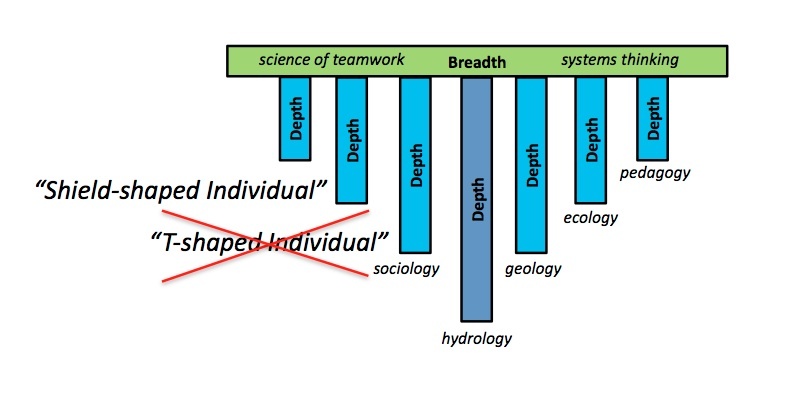 We compare and contrast our ‘Idaho Model’ with alternative interdisciplinary educational models that are built around a framework of the ‘interdisciplinary individual’ who conducts interdisciplinary research without being part of a collaborative team.